He built a dinosaur theme park and planned to construct a new Titanic. 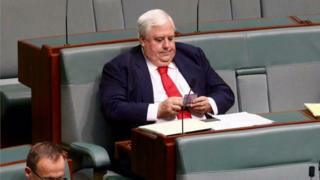 But a move into politics appears to have sunk eccentric Australian billionaire Clive Palmer, writes Trevor Marshallsea. A powerful juggernaut of enormous ambition, thought to be unstoppable until striking an unforeseen obstacle. The words could describe the world's most famous ship, the RMS Titanic. They could equally apply to the political career of larger-than-life Australian billionaire politician Clive Palmer, who once aimed to build a replica of the ill-fated liner. Often called Australia's Donald Trump, Mr Palmer embodies his home state of Queensland: big, brash, with some rough edges and a disregard for political correctness which endears him to some and sparks disdain from others. With as much chutzpah as he showed in changing hair colour, he traded business for politics and won a seat in the national parliament in 2013 after forming his own political party, the Palmer United Party (PUP). Similar to Pauline Hanson's polarising, anti-Asian One Nation party two decades earlier, the PUP promoted itself as an alternative to the established two-party order. It stunned Australians when it gained the balance of power in the nation's upper house, the Senate. But just three years later, Mr Palmer has announced that he will not contest his seat of Fairfax at the next election. He may run for a Senate seat - other PUP members definitely are - but it seems that the Queensland mogul is a spent force. Queensland's richest man could also face criminal charges, bankruptcy, and the unravelling of his financial empire, over the collapse of his nickel operation in north Queensland, which put almost 800 people out of work. The eccentric billionaire appears to be sinking in a sea of bad news. Formerly a lawyer, and an adviser to long-serving right-wing Queensland premier Joh Bjelke-Petersen, Mr Palmer built his fortune first in real estate, but then more substantially in coal, iron ore and nickel. At the height of his pomp in 2011, his empire was estimated to be worth A$5bn ($3.7bn; £2.6bn). He owned a football team, Gold Coast United, in the Australian A-League. Despite on-field success, the club folded after just two seasons when Australian authorities revoked Mr Palmer's licence. One of Mr Palmer's most notorious follies began in 2011, when he bought his favourite holiday spot, a high-end golf resort on the Sunshine Coast, north of Brisbane. Formerly the Hyatt Regency Coolum, he renamed it the Palmer Coolum Resort and announced ambitious plans to build a dinosaur theme park called Palmersaurus. More than 150 animatronic dinosaurs were brought in to populate this cut-price Jurassic Park, including a T-rex named Jeff who was placed next to the fairway on the 9th hole of the golf course during the 2012 Australian PGA Championships. Australian golf officials promptly took their prestigious tournament elsewhere. Equally strange was Mr Palmer's plan to channel his cash into building a replica of the Titanic, called Titanic II, with the help of a Chinese consortium. Speaking to the Telegraph newspaper in 2013, Mr Palmer referred to his project as "a ship of peace". "Why build the Titanic? Why go to the moon?" he continued. "Why do the Yankees play the Redsox? Why did Christopher Columbus discover the Americas? Because they could, and I can, and we can build the Titanic." Next came Mr Palmer's audacious plan to enter politics. Not only was Mr Palmer voted into Australia's lower chamber, the House of Representatives, three PUP candidates were elected to the finely balanced Senate, and with the help of an alliance with another MP, the PUP suddenly held the balance of power in the nation's house of review. Mr Palmer was fond of stunts such as arriving at parliament in his Rolls-Royce, likened political opponents to Hitler and called Rupert Murdoch's ex-wife Wendy Deng a Chinese spy. It didn't take too long for his fortunes to turn. He inflamed sensitivities in China - where he does a considerable amount of mining business - with an infamous tirade on national TV where he referred to "Chinese mongrels" who "shoot their own people". And only a year after gaining the balance of power in the Senate, the PUP surrendered it, with Mr Palmer's leadership style driving away his own senators and key allies. Mr Palmer's own popularity with the electorate began to wane, partly due to his own version of a low turn-out: he went to Canberra for federal parliament for just 54% of its sittings in 2015, the lowest of any MP. His image outside of politics has also been battered. Surprising no-one, his dinosaur park folded last year. Reports say no work has been done on the Titanic II and its future is in doubt. But his biggest problem is at Queensland Nickel. Just six years ago, Mr Palmer gave staff at the Queensland Nickel refinery Christmas gifts including 55 luxury cars and 700 overseas holidays. But in the past three months all 787 workers there have lost their jobs and the plant has been put into administration with massive debts. An administrator's report accuses Mr Palmer of recklessly siphoning off A$200m from the plant to fund other corners of his empire, including A$6m for the Titanic II project. This is said to have left Queensland Nickel in too weak a state to absorb a global downturn in nickel prices. Administrators say they will refer the matter to Australia's corporate watchdog, which means Mr Palmer is in danger of facing criminal charges which can carry a jail term of up to five years. Mr Palmer denies the allegations against him, and says he is suing the administrator. Media commentators, however, are already writing obituaries, framing the Palmer phenomenon as a fad based on money and little else, and proof the Australian electorate demands more than mere irreverence and a promise to shake up the two-party establishment. Like the dinosaurs and the Titanic, Mr Palmer's ambitions are poised on the edge of oblivion. He faces extremely serious allegations of misconduct in business. But at a press conference on Wednesday he seemed unfazed, refusing to rule out a run at the Senate. "Courage is about moving on," he said. "A lot of people cry when they leave parliament, I just think about the good things that can happen."